Anna has been teaching yoga internationally for 10 years and in Cambridge for the past 8 years. She has completed a 16-month full-time intensive yoga study course at Agama Yoga. This included the completion of her Teaching Training qualifications in the Agama Hatha Yoga system (Yoga Alliance and International Yoga Federation recognised). Anna has travelled extensively in India including periods of study in Rishikesh, Pune, Dharamsala and Kerala (Mata Amritananda, Amritapuri Ashram 2009, 2010). In 2012 she completed Yoga As Therapy Advanced Training with Doug Keller. 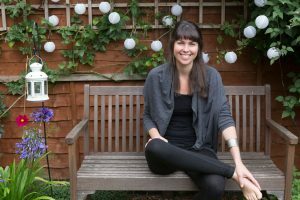 In 2015 she completed her qualification in Restorative Yoga and in 2018 her qualification in Pregnancy Yoga. Bringing depth and richness to her yoga practice is an avid interest in Ayurveda and Tibetan Buddhism. She participates annually in Buddhist meditation retreats with renowned Tibetan meditation teacher Tsoknyi Rinpoche. She is delighted to introduce the path of yoga to anyone interested. No matter someone’s reason to try the practice, she knows that yoga will have something to offer!